This year's Golden Globes was made significant by the hordes of celebrities who showed solidarity against abuse and injustice. It is inspiring to see the people that we admire stand up for what is right and make a stand against a damaging norm that has ruled Hollywood for years. On the local front, I hope that more celebrities would find the balls to also take a stand against extra-judicial killings. I hope that the popular mainstream stars who can rake in millions in earnings for a single film can go beyond the superficial glitz and use their celebrity status to impart one basic truth - that taking a life/goading people to take lives is unacceptable and unforgivable regardless of intent. There should be no debate on that particular issue regardless of which politician you support. 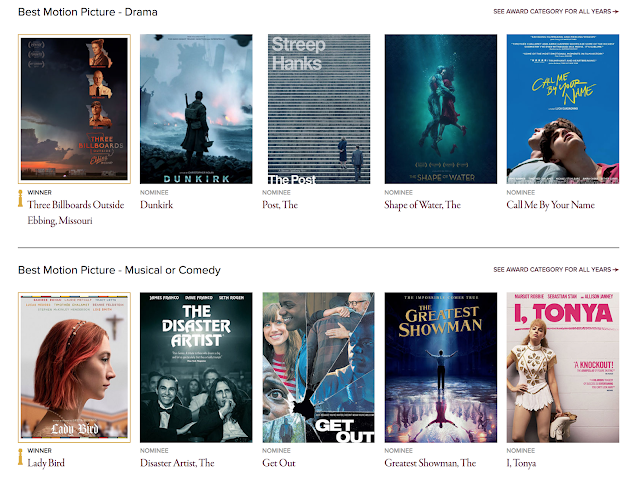 Anyway, here are the winners of this year's Golden Globe Awards.